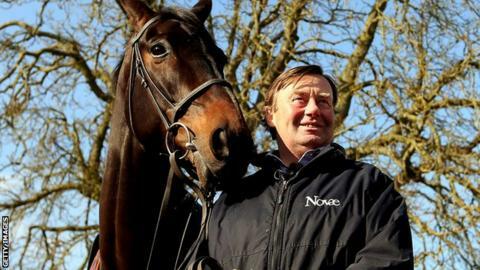 Trainer Nicky Henderson is hopeful that Sprinter Sacre will make a successful return to the track, but insists "it's not the end of the world" if he suffers defeat. Despite concerns about the rain-soaked going at Ascot, Britain's highest-rated chaser is all set to compete for the first time in nearly 13 months in Saturday's Sodexo Clarence House Chase. A heart condition sparked an absence which some feared could spell the end of one of the sport's most exciting careers. First of all it was an irregular heartbeat, diagnosed after the horse, previously unbeaten in steeplechases, was sensationally pulled up by jockey Barry Geraghty in a race at Kempton in December 2013. That problem was quickly righted - though it's still monitored - but then the Henderson team just wasn't happy with the condition of the stable star. Prior to that, the sky appeared to be the limit for the nine-year-old, running in the silks of owner Caroline Mould, when he carved out a special place in racing history with a hat-trick of successes at the big three festivals during the previous spring. At Cheltenham, rivals in the Queen Mother Champion Chase were seen off effortlessly by the horse they call the 'James Bond of steeplechasing'; at Aintree, he was neither shaken nor stirred in winning the Melling Chase; and at Punchestown, hard as the great Sizing Europe tried, he didn't manage to play the villain. After all those months on the sidelines, it had been hoped that Sprinter Sacre, the winner of 10 chases from 10 starts before the Kempton drama, might return to action in December. However, Henderson, helped to his third trainer's title in the 2012-13 season by the horse's exploits, was still not satisfied he was ready to do himself justice. However, following quite an examining workout under Geraghty on the racecourse at Newbury just after Christmas, the trainer's convinced the time is right. "We are desperate to run," he told BBC Sport. "The timing is perfect. Whatever happens, and whatever ground we get, it gives us lots of time to build on it between now and Cheltenham [the Queen Mother Champion Chase, March 11]. "If you wait for the Game Spirit Chase (at Newbury on 7 February), the only other option for a horse like him, you're four weeks from Cheltenham so I'd rather do it now." With his success rate, scintillating jumping and authoritative winning style, Sprinter Sacre has become box office stuff, capable, like Frankel was on the Flat, of making a measurable difference to crowd figures. Tingle Creek Chase winner Dodging Bullets has been well backed against him but what, I wondered, should the horse's excited but apprehensive fans expect at Ascot where the opposition should theoretically be easily swept aside? Henderson said: "Sprinter schooled on Friday and was absolutely amazing, which was great, but there's going to be a lot of improvement - there has to be. "If he gets beaten, of course we are going to be disappointed, but I'm optimistic this is going to come out on the right side, though we have to say it isn't the end of the world if it doesn't. "We need the race and have got to take it as it is, on unsuitable ground, which might just undo him." Inevitably, doubts about Sprinter Sacre's future have raged in the racing 'village' ever since his glittering career came to such a shuddering halt over a year ago. But Henderson, Geraghty, work rider Nico de Boinville and others closest to the horse have remained firm in their belief that he would be back. The big question now is can he ascend to the very top of the tree as before? Henderson said: "I don't say he's been running round [on the gallops] like he used to, but put a fence in front of him, and everything lights up again, so I hope so, I really hope so."